The RH door latch was stuck “shut” and the LH door latch had the opposite problem. I hadn’t manage to lose my impact driver yet so both doors came apart for minor surgery. stabbing the latch mechanism via the top of the passenger door with a tire-iron granted access to that side. 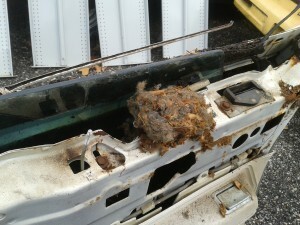 There was no build sheet hiding behind the upper passenger door panel but there was a mouse nest. A rather inconvenient location don’t you think? 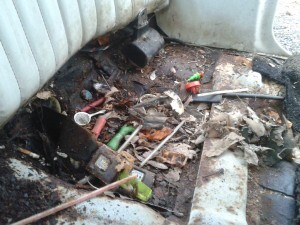 The door panels were re-installed and the back seat came out next…partly to clean out gunge…partly to hunt build sheets. Some of the previous owners had some rather messy kids. Sheesh! Mr. ShopVac worked overtime that day. No sign of a build sheet yet but I’m holding out hope for the top of that gas tank. By the way, my camera battery was dead so no pics… but what’s interesting is that the door latch assemblies on this car is almost identical to the one that came out of my 1986 Chevy Pickup. It’s literally a bolt-in with the exception of the pivoting piece that the door lock mechanism attaches to. That pivoting piece is staked to the latch assembly but could be ground off & retro-fitted easily enough. What usually renders these door inoperative is one of two small springs that eventually rust and fail, causing the mechanism to jam. Both plastic grilles somehow survived the test of time despite the lower mounting panel completely rusting away, leaving each piece literally hanging by two bolts at the top of the header panel. I removed the LH one hoping to somehow gain access to the primary hood release but all that gained was…well, removing half the grille. Since the the cable itself had snapped somewhere within its sheathing, I removed the left front plastic kick panel & hacked away at the sheath — thankfully, the cable snapped close to the end and one pull with some needlenose pliers popped the catch. 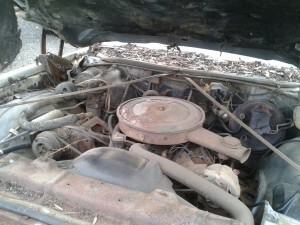 The hood did not budge though…as the hood hinges had frozen over the years. After fifteen minutes of gently prying around the circumference with screwdrivers and scrapers (imagine opening a gigantic paint can lid with a butter knife), the hood lifted enough to drown the hinges with WD-40. After the hood rose enough to access its mounting bolts, I detached one hinge, de-springed, oiled, banged it repeatedly on the concrete until it eventually freed itself up, & reinstalled it. After doing both sides, we have a functional hood. Functional normally implies “Ram Air” but in my world means “it opens”. The fruit of this labor was a relatively intact engine compartment. Incredibly the yellow emission decal survived along with the “Keep your GM car all GM” sticker. It’s hard to notice but I believe water running through the hood louvers pooled up on the air cleaner lid & eventually rusted its way down the carb stud and into the engine. Inside the air cleaner looks horrible & the chances of this engine ever turning over are somewhat slim. But “we” (I) will pull the plugs, oil the cylinders and give it the old college try for giggles. so there may be a transplant. I’ve got to clear out the driveway and this just may be the catalyst to “process the Pontiac”. A wee bit of scale! 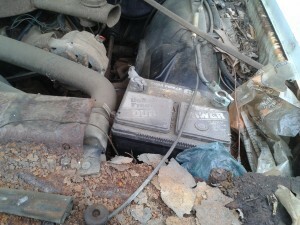 Any clue how old that Delco battery is? 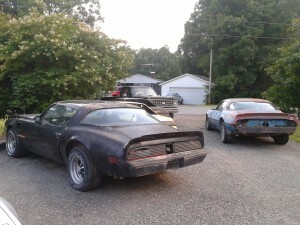 Soul-searching probably has no place on a car-related blog but it’s hard for me to separate the two. This car obsession of mine did not evolve or develop; it spontaneously combusted at the age of three…and has pretty much led me around in multiple directions; few of which have produced positive results. It’s that monster that is never satisfied yet I can’t seem to resist feeding it. Idolatry is a dangerous thing and it is my pet sin. Announcing this personality disorder at the start of this blog makes me feel a little more comfortable… at least the reader understands that the writer is not hiding behind his awesome cars I never would have attempted this little exercise had it not been placed right under my nose. (Thanks Rob — I may have to actually grow up now!). So whoever reads this will not see anything get fixed. On the contrary, there will likely be fifty or more completely separate projects essentially going nowhere and a whole lot of posts about accumulating more “treasures” which probably should have remained at my favorite hangout, a local scrapyard. K? Hopefully this endeavour will last longer than my short attention span! Writing is a chore so rather than spend hours thinking of a creative introduction, let’s just say that I’m 43, live in NC, have a tendency to hoard anything old that’s made in USA and has wires or wheels. Pontiacs, Buicks, and Oldsmobiles of the 70’s would be my favorite modes of transportation. My current daily driver is a 1987 Pontiac Fiero with a dull-as-dishwater 2.5 liter Iron Duke and automatic transmission. What makes this thing special to me is that it’s blue. 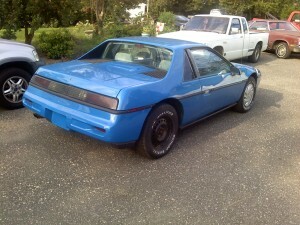 Blue was only offered in 1987 and is by far my favorite Fiero color. After close to fifteen years of looking…this one popped up on Craigslist a year or two ago and the $1,400 asking price was very fair. I could write pages just about the nice gentleman I bought the car from but that would be a bit much. This one was probably just a dealer stock order since it has no interesting options to speak of: just A/C, automatic, tilt, tinted glass, and the UM6 AM/FM Stereo with cassette. The Wal-Mart wheelcovers disappeared immediately and were replaced with some original P02 plastic covers that I had scrounged up years ago from who-knows-where. It’s working on 8:30pm and this little guy is sitting at the parking garage at work, waiting to take me home. I’m tired. Hopefully the deer will be too tired to play chicken with me.